Hardwood floors really add a lot of value to a home both in monetary terms as well as in the comfort and warmth of a home. More and more people are installing hardwood floors instead of carpeting these days because it is so much easier to keep clean and collects far less dust. If you suffer from allergies investing in a hardwood floor may be the right solution for you to limit the amount of dust in your home. While you are at it install a central vacuum with the exhaust outside. This will ensure that any micro pieces of dust that are exhausted through the vacuum are distributed outdoors in the garage or car port instead of back into your home. regular vacuums just circulate these small particles which can really be difficult for any one who suffers from allergies to dust and mites. Enough on allergies, back to cheap hardwood flooring. When you are buying hardwood flooring there are many issues to consider. We have listed some of the major ones to give consumers something to think about and act on before they place their order regardless of whether they are installing it themselves or having a professional install the floor for them. Consider each of the above items and decide how much money you want to save when you install your hardwood flooring. Material – purchase high quality material always. It needs to last a long time and you do not want to replace the floor any time soon. Installation – who will install the floor for you? do they have good reviews? is the installation included in the price? Do it yourself – there are training courses offered by many companies which are often free and cover the basics of installing hardwood floors along with Youtube videos. Pre finished – hardwood is by far the easiest and least dirty in terms of dust. It is much faster as well. Once the floor is installed, it is ready to be used. Hardwood floor installation prices will vary a great deal depending on where you live, the type of flooring you are installing and how much cutting and fitting you need to do. For example, the picture on the left shows a fireplace that needs to have the floor fitted around it. While it is not that difficult to do, it does take time with the extra cutting and fitting and it must be done right. After all the fireplace is the focal point of the room and any mistakes will be noticed by virtually everyone. There are many examples that will affect the installation price. Discuss your plans and the details with your souse and of course the contractor to make sure that you have a clear idea of what the finished product is going to look like. While this may not be an all inclusive list, readers can quickly see that the hardwood floor installation price can vary a great deal depending on what you have to deal with. Most handy men can install hardwood floors themselves and save a great deal on the overall cost of your new floor. You may have to purchase or rent a few tools to make the job easier, however the money you save will more than pay for these tools. Take your time, watch YouTube videos and read lots on line. We find that many hardwood flooring suppliers will also provide courses for people planning to do their own floors. They do this to enhance their sales value and entice you to purchase the materials from them. Even if you make a few mistakes and have to redo some portions of your floor, it is still al lot cheaper than paying for someone to install the floor for you. 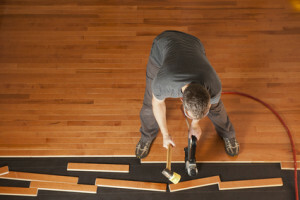 Using a professional to lay a hardwood floor can save a great deal of time. Compared to working evenings and weekends, have a floor installed over one or two days is preferred by many people. They do not want to put up with the mess for several weeks or longer and they want it done right. They may not also have the skills, the tools and the patience to try installing a floor themselves. Many suppliers either will have their own installation teams that they provide for a price to install a floor. They are either on staff or they are preferred installers with an excellent record of quality workmanship. The time to negotiate the overall price including installation is before you agree to the hardwood. Combining negotiations for the price of the hardwood and the installation can sometimes get you a better price. Don’t buy the argument that they cannot negotiate on installation price, because the installer is not available or does not vary his price. Be prepared to walk away unless they are willing to reduce the price offered from the initial deal. It may take some tough negotiating. But after all you do not have to cut the deal until you are totally satisfied. Compare prices and compare reputation and work quality. If you need to or feel it is in your best interest, ask to speak to previous customers to confirm satisfaction levels. Also check on line for any comments that may be available. Do your homework and there is a better chance that you will be totally satisfied with the hardwood floor installation price, the quality of the wood and the quality of the installation. After all, you will have this floor for many years and consumers want something they are going to be proud of and satisfied with for many years. Most people would like to get the best deal they can on anything they purchase. That includes hardwood floors. When we wanted to put a new hardwood floor in our house , we did not take the first offer that came along. We wanted to get a good deal on a new hardwood floor. We spent a lot of time getting to know the various kinds of wood and what we wanted to install in our home. We also discuss warranties and installers. How many installations they had completed, when would the start and when would they finish. We wanted to make sure that once they started the job, they stayed until the hardwood flooring job was completed. Once we knew exactly what we wanted, the next step was to find the deals that were available for both the hardwood as well as the installation. While it takes more time, look at it this way. The money you save is after tax dollars that you are paying yourself. The money you save can be used for something else that you really want to get as well. 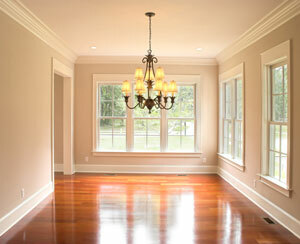 In addition and even more important, making sure that you hire a great hardwood floor installer is vitally important. A good deal is not a good deal when the floor is not installed properly. Some consumers will try to do their own installation work. For information on general do it yourself issues, consider reading more about, Do It Yourself Projects. We started looking for ‘contractor sales’ at places like Home Depot and Lowe’s. This is a great little tip that we’re able to come up with through a little research. The real question is whether these are really ‘contractor’ sales or whether they are closer to ‘extra inventory’ sales events which are used to get people into the stores to buy other products. Guess what? Who cares? Discount sales are your friends no matter how they are labeled. The larger the discount you can get on your new hardwood floors, the better. Use these sales to your advantage and call the stores directly to find out when they are being held or just check often with one of the guys working the floor. If you do take advantage of one of these sales and it is the end of the inventory, make sure you buy enough to do your complete floor to avoid not being able to buy that last piece to finish the floor or to buy flooring with a slightly different stain. Ask for quotes that are written down and if another store has the same flooring you are looking at let them know you have a quote and even show them your quote. They know at that point if they want to obtain your business, they have to give you a better price or lose the deal. Read up on “discount hardwood floors” on the web. There are literally a ton of different data options available for people who are looking for discount hardwood floors. Personally I like to talk to a real person when I am making these kinds of decisions, however the web can really help to educate you so that you know all of the right questions to ask. One thing to remember when you are negotiating a combined price for the floor and installation, is to go with a fixed price so that there are no surprises once the work is completed. In fact, just because something is discount doesn’t necessarily mean that it is of substandard quality. It just means that you are getting a better deal due to extra inventory, the store trying to drive sales or discounts the store received from the supplier who is trying to drive sales up. Discount is your friend when shopping for anything including different parts of your house. So you have decided that you want to install a new hardwood floor. Your old carpets are beginning to look pretty grungy, matted and generally just not nice. Being the smart consumer you are, you have requested several quotes from several stores which also include installation. You have no idea what Hardwood Floor Costs are until you begin looking at various quotations. You have just received your first estimate and are suffering from sticker shock from the cost estimate to place a hardwood floor in your home. Now what to do, should you go back to carpet or take the plunge and go for hardwood flooring? Most people do not realize is that there are parts of a hardwood floor that are more expensive than others. It is important to identify these areas and make a decision regarding what you want to do in these specific areas, especially if you’re cost conscious. For example one of the most expensive portions of a hardwood floor are the stairs. Most people will want to continue their hardwood floor up the stairs and into the upstairs hallway and bedrooms. Even a straight stair is more expensive per square foot, while a stairway that is curved will drive up the cost considerably.Many people avoid placing hardwood on the stairs due to cost, but also due to a concern about the floor being more slippery. They are afraid they may slip and fall down the stairs. From many years of walking up and down stairs with hard wood on them , we can say that you adapt and are just as sure footed on these stairs as we would be on carpeted stairs. So if you are at all counting your pennies, consider leaving the stairs covered in carpet that blends well with the hardwood floor that you have placed in other areas of your home. You could also place a carpet runner on the hardwood stairs, however we think this kind of defeats the purpose. 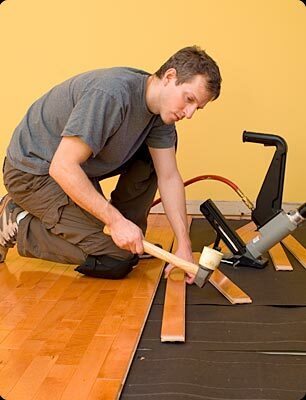 Another significant cost area is the labor that is required to install your hardwood floor. Typically, installers will charge equivalent dollars for installation to the cost of the material. Floors that are rectangular, with lots of straight stretches are easy to install. Floors with lots of doorways, curves or fancy patterns just take longer to install due to the cutting and fitting that is required. Installers may increase their charges somewhat to accommodate this extra work. Take this aspect into account when you are making decisions about the design of your hardwood floor. You may also want to consider installing the floor yourself. Take a course at a local renovation store, such as Home Depot, and do the installation yourself. Not only will you save lots of money, you will be able to afford to do some of the other renovation projects that you planned to do. The final aspect we want to mention is whether to install pre-finished hardwood flooring or to install hardwood floor that must be finished after installation. This is very much a pricing issue and consumers should obtain several quotes before they make a decision. However there is one other critical issue. 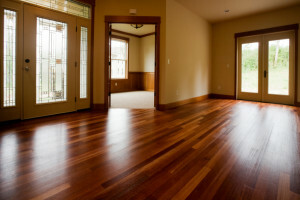 A pre-finished hardwood floor can be installed rapidly and be finished in several days or less, while a natural hardwood floor is going to take several weeks due to installation, sanding and finishing activities.For my money and time, pre-finished hardwood floors are the only way to proceed. 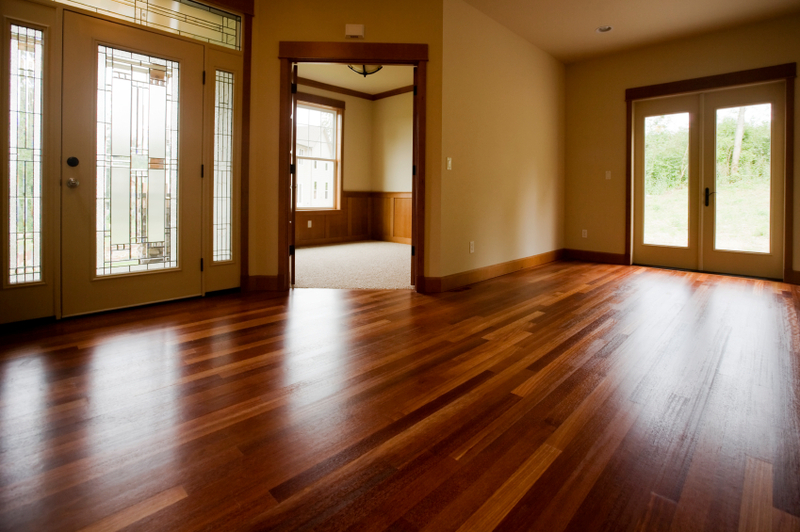 Although sanding generates lots of dust, so does the installation of any hardwood floor. The process of nailing seems to dislodge dust on the floor and even if you vacuum ahead of time there is still lots of dust you cannot get to. If you do decide to sand a floor, always use a dustless sander which has a vacuum attached and expels the dust outside the home into a bag that contains all of the dust generated by the sander.